The University of North Carolina has been playing baseball since 1867. They compete on the Division 1 level and have been a member of the Atlantic Coast Conference since 1953. UNC baseball plays at Bryson Field at Boshamer Stadium, a 5000 seat facility in Chapel Hill, North Carolina. Their nickname is the Tar Heels. In 1921 North Carolina became a founder member of the Southern Conference. They started to to see success in 1932 when they hired former Major League pitcher Buddy Hearn as coach and would win six Southern Conference titles during his 15 year tenure. Walter Rabb would take over as head man in 1947 and would be at the helm for 31 years. During that time period UNC baseball would make five NCAA tournaments and four College World Series. They would also move from the Southern Conference to the ACC in 1953. Mike Roberts would coach the squad between 1978 to 1998. He would make two College World Series appearances and claim five conference titles. During that time period the program would produce Major League stars such as B.J. Shuroff and Walt Weiss. 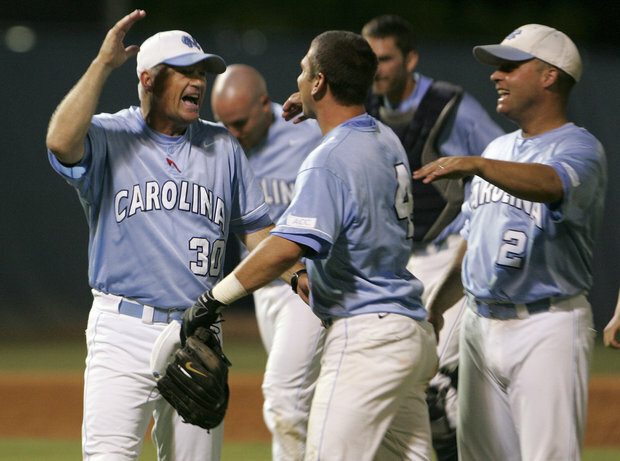 Mike Fox, who had helped UNC baseball to the 1978 College World Series as a player, would be the team’s next and current coach. His tenure has been highlighted by four straight College World Series appearances between 2006 and 2009, with the Tar Heelsl finishing runner up in 2007 and 2008, both times to Oregon State. Seattle Mariners teammates Dustin Ackley and Kyle Seager and New York Mets ace Matt Harvey were the team’s stars during that run. The Tar Heels made it back to the World Series in 20011 and 2013. However the weren’t able to make it to the title game in 2013, which could be construed as disappointing result since they went into the 2013 NCAA Baseball Championship as the number one overall seed. UNC baseball’s biggest rivalry is probably with NC State, although they have also some history with the South Carolina Gamecocks and the Clemson Tigers. Major League players who went to North Carolina: Bob Lawson, Moonlight Graham, Fred Stem, Vern Duncan, Harry Hedgpeth, Shag Thompson, Larry Woodall, Clem Llewellyn, Fred Johnston, Herm Holshouser, Buck Stanton, Burgess Whitehead, Nate Andrews, Johnny Peacock, Johnny Humphries, Tommy Irwin, Jim Mallory, Snuffy Stirnweiss, Clyde King, Claude Crocker, Hal Brown, Garry Hill, Dave Lemonds, Tom Buskey, Bill Paschall, Dwight Lowery, Chris Pittaro, Scott Bankhead, B.J. Surhoff, Walt Weiss, Matt Merullo, Jesse Levis, Paul Shuey, Brad Woodall, Jim Dougherty, Mike Jerzembeck, Mike Bynum, Kyle Snyder, Ryan Snare, Tyrell, Godwin, Adam Greenberg, Chris Iannetta, Andrew Miller, Daniel Bard, Alex White, Dustin Ackley, Kyle Seager, Andrew Carignan, Tim Federowicz, Luke Putkonen, Adam Warren, Rob Wooten.